We all store sensitive and confidential information on our computers – so what happens if you lose it or worse its stolen? Can encrypting your computer protect the information stored on it? Who are you hiding your data from? Let’s get clear on this, its not the security services like CIA, NSA, MI5 you are protecting your information from – it is a known fact that all technologies from companies like Facebook, Google, Apple and Microsoft all have open backdoors for government agencies to access your data…we have Edward Snowden to thank for that! Instead, it is the would-be opportunist thieves that have obtained your computer and want to steal your confidential passwords and personal information you should be concerned about. More airline companies are forcing you to check in your laptop on arrival, so while you are waiting in the airport for your flight, how do you knwo it’s not being tampered with – if you encrypt your devices, you can be sure no-one does! Is having a password enough? Some people assume that simply by having a password on your computer, this protects your information. Unfortunately, hard drives can easily be removed and the files accessed by using another computer, so this is not true. 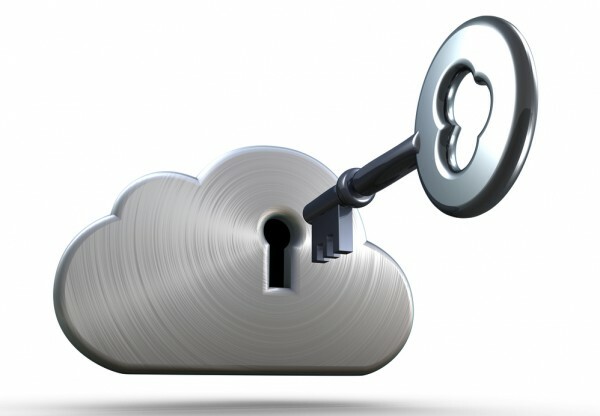 If you want to truly protect valuable information stored on your computer then I recommend encrypting it. Encryption is a way of making your information unreadable to anyone who doesn’t know the password for your computer (make the assumption that if you give someone your password then they have full access to everything saved on it). Normally a whole hard drive (all of your computer) is encrypted which means that all your documents, spreadsheets, images, music etc become unreadable. What encryption does to the files on your computer is make them unreadable, so instead of words in a document, numbers in a spreadsheet and images in an album; they appear as jumbled letters and numbers totally camouflaged from prying eyes. 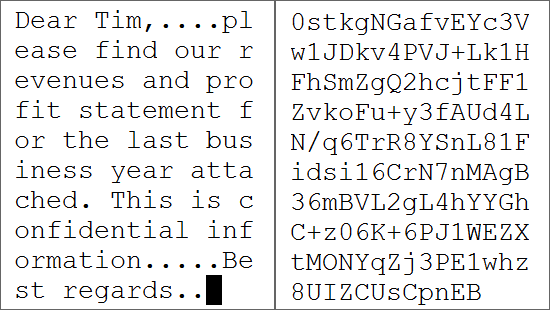 The example shows clear text on the left which is decrypted and on the right the same text encrypted. Much like you have a key to unlock a door, you also encrypt your files using a key which is normally a long sequence of numbers and letters. You also use this key to decrypt and reveal your files. Do you need to enter an encryption key every time? If you know the password to your computer (Windows or Apple) then the files remain unencrypted. It is only when trying to access the files without your computer password or if the hard drive is taken out of your computer that the files become encrypted. What if you lose the Encryption Key? You are in trouble as without the key it is impossible to decrypt your files. However, both Microsoft and Apple will store your encryption key inside your free iCloud or Outlook online account. I also recommend printing it off and storing it somewhere but not with the words “this is my laptop’s encryption key” written at the top! How to encrypt your computer hard drive? If you have an Apple Macintosh computer then the solution is easy – turn on the inbuilt FileVault and wait for it to complete. For Windows 10 users it depends on the version of Windows you are running (Home or professional). If you are running Windows 10 professional then encryption will likely be built in using Bitlocker. However, this is not the case for the Windows 10 home version and I recommend using VeraCrypt instead. The links to all three products mentioned above contain short video tutorials on how to enable full disk encryption. If you are saving your files using cloud services like Google Drive or Dropbox then you have the flexibility of managing and editing those documents using your browser instead of locally on your computer. By un-syncing your files so they are not stored on your computer means you don’t need to worry about encryption. However, if any of your devices have been lost or stolen I always recommend changing the password to your Dropbox or Google Drive account. Is the Chromebook a more secure alternative? Without question, a Chromebook is safer than Windows, OS X, Linux, iOS or Android as security is baked into its design. Chrome OS the operating system that runs on a Chromebook automatically encrypts all your files and there is no way another person using the same Chromebook can see anything of yours. Even if a would-be thief were to rip out the solid state hard drive, the automatic encryption renders the information useless. Should you encrypt your computer?